I’ll admit it. I do love baked potatoes. But here’s the problem. Cooking them was always way too difficult. OKAY. Not difficult. Just annoying. First, you could bake them in the oven for agessssssssss, which always ended me with either – raw potatoes – or – burnt to a crisp because I swear they were raw 3 minutes ago potatoes. Then..there was the option of microwaving. Which also left me with half baked potatoes. And…multiple times I stabbed myself trying to prick the potatoes with a fork. Potatoes - however much you want (max of 5 pounds). You can peel them or chop them if desired. They need to all be roughly the same size. Close lid and turn the sealing vent to "sealed"
P.P.S. 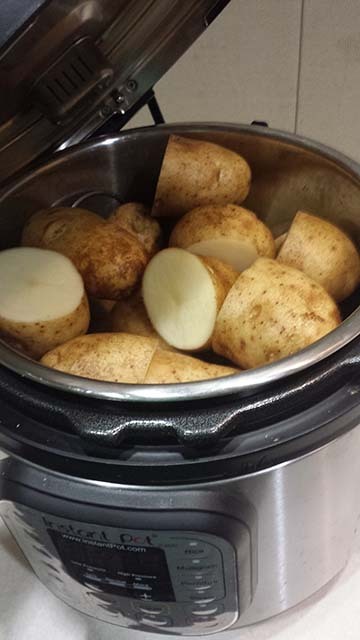 - These potatoes are super soft - I think they're perfect :) If you prefer a crispy skin, you could bake them for about 10 minutes at 350 degrees after you finish cooking them in the instant pot. Lawnrence @ Best Pressure Cookers recently posted…An Unbiased Study of Power Pressure Cooker XL Reviews – Are the claims true? They are so great! I’d love to hear what you think if you give it a shot! what a great video! Please make more!! You are awesome! thanks for the instructional video! As you saw I put a link in my blog to your tutorial. I use your method weekly – I have it pinned on Pinterest. It works perfectly for both sweet and white potatoes and I have even combined them and they turn out perfect every time. Thank you for this post! Such a time saver! Do you have videos on potato soup? Sounds like a great start to potato salad too! Question – less cooking time for say 1/2 inch pieces?? What would you guess? YUM! Now I want potato salad!! When I make sweet potato soup, I cut the potatoes into smaller pieces as you describe, and I cook it for 4 minutes, natural pressure release. Perhaps give that a try? Thank you for giving the time it takes for “natural pressure release”. How long does the cooking take from closing the lid to eating the potatoes? This totally depends on how full the pot is 🙂 The fuller it is, the longer it will take t come to pressure initially (as there is more volume to heat up). I like to set and forget these about 45 minutes before I’m ready to eat. Thanks for the video, but the title is misleading, because these are steamed potatoes, not baked potatoes. There is a world of difference between the two. You’re welcome to toast them in the oven if you wish after cooking! In our area, this is referred to as baked potatoes. I do love my IP, and I have cooked a lot of potatoes for potato salad and mashed potatoes in it, but they are steamed, not baked. Baked potatoes have a completely different texture than steamed potatoes or boiled potatoes. The type of potato varies, also, depending on whether you want a waxy, sticky potato or a fluffy one. Cooking cut up potatoes and eggs together for potato salad in 4 minutes is just a tiny kitchen miracle, and probably one of my favorite things to do because potato salad is one of my most favorite foods, but I’ll nuke my potatoes for 5 minutes, then put them in the oven for 30 or 40 minutes for a crispy, crackly skin. Win win, right?! So glad you liked them! Are they ready to eat if I do the fast release? I don’t want to wait the 20 minutes for natural release. Hi Angie! The natural release allows them to finish cooking. It’s required for the cooking process! It doesn’t hurt to give it a try, Angie. If they’re not quite done, you can finish them in an oven for a crispy skin, or put them back in the PC for a few more minutes, no harm done! I just tried doing 10 mins cook time, 5 mins natural release, then quick release with 2 small russet potatoes. They were definitely underdone. The 20 min wait is crucial…or try cooking them longer, then using quick release. Not sure I’ll do IP for potatoes. I get a non-crunchy cooked “baked” potato from 6-7 mins in the microwave (puncture skin with fork before cooking). Much faster and I enjoy the results. Yes – natural release is required for this recipe. Thanks for sharing your idea I very likely will be doing this very soon. The only comment I have is when you are working with food, it bothers me that you can’t seem to stop touching your hair without showing that you are washing your hands. I cooked 2 medium sized potatoes for 10 mins. Left for 20 and still a little raw. I put 1 cup of water in?? Hmm. That’s odd. I’ve cooked them this way may times and not an issue. Did the pot come to pressure properly? Another way to crisp up the skin is to throw them in a pan with some salt and butter after cooking. Oh no! That is so odd! I have done this so many times without issue 🙁 Are you sure the pot came to pressure and sealed properly? I am new to the Instant Pot thing. When a recipe doesnt specify the pressure, do you assume high or low?